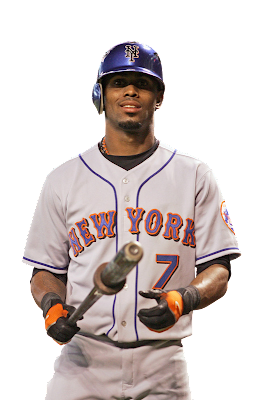 David Lennon of New York Newsday is reporting that Jose Reyes has suffered a setback in his rehab. He is on the disabled list due to tendinitis in his right calf and knee. Even before the injury, Reyes lacked the dynamic that made him one of the most exciting players in the game. Hopefully, this setback is a minor one and he can be the old Reyes in the second half. But if you're nervous, I do not blame you. Jose Reyes had to be pulled from today's extended spring game in the third inning and he is headed back to NYC to be seen by Dr. Struan Coleman tomorrow. Reyes experienced discomfort in his right knee, which has been bothered by tendinitis, and the Mets want to make sure there is no structural damage. According to reports on WFAN, Reyes pulled himself out of the game due to recurring pain. The initial MRI exam revealed no structural damage but the New York Mets are pushing Reyes to be ready ASAP. They would have preferred to avoid putting him on the disabled list at all, but someone apparently talked some sense into the front office. If they find structural damage this time we may be without Reyes for a long time.